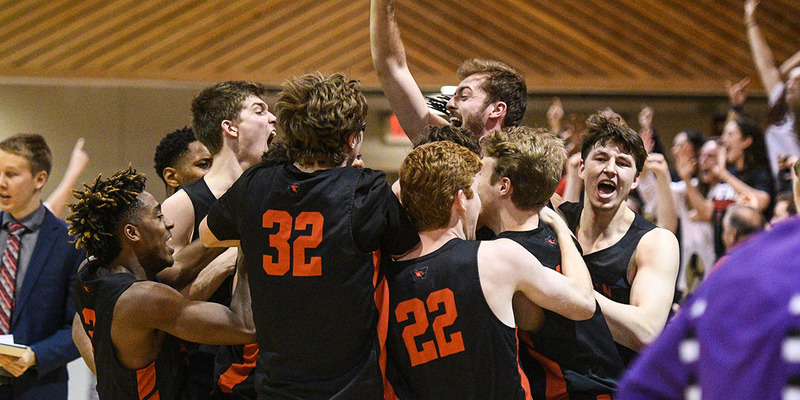 The Wesleyan men’s basketball team, ranked 15th in the country, had an exciting end to their NESCAC season this past weekend. In the NESCAC semifinal, the Cardinals sunk a buzzer-beater to secure a 65-63 win against Amherst. The next day they fell to Williams, who is ranked 5th nationally, in the NESCAC championship game with a final score of 69-58. The weekend’s games took place in Amherst, Mass. at the home of the Mammoths. Saturday evening was a close game, with the Cards leading by six at halftime before Amherst outscored them by four in the second half. The Cardinals needed a big game and a big shot from Nathan Krill ’18, which is exactly what they got. Krill dropped 29 points, including the game-winning 3-pointer with 1.7 seconds left from well beyond the arc. This capped off a game in which Krill also grabbed 10 rebounds and went 7-11 in 3-point shots. Offensively, the Cardinals struggled, only shooting 36.9 percent from the field, but counteracted this by hitting 41.7 percent of their 3-point attempts. Their defense was stout, per usual, holding the Mammoths to 35.5 percent shooting and only 30.8 percent from three. Coach Joe Reilly was excited after the game and already looking ahead to Sunday. Jordan Bonner ’19 also had high praise for the Cardinal senior. Unfortunately for Reilly and the Cards, they ran into the Williams Ephs on Sunday. The game had a decidedly defensive tone as both teams shot under 40 percent from the field and under 30 percent from 3-point range. Wesleyan shot an abysmal 18.8 percent from three (6-32). The team was led by Bonner, who scored 15 points, and Krill, who scored 12. However, it was not enough to get by Williams, who outscored the Cardinals by eight in the first half and three in the second half. Bonner hopes to see Williams again in future play. Although the Cardinals didn’t take the NESCAC, the team still has a lot to be proud of. This edition of the men’s basketball team set a school record for wins in a season with 21 overall. In addition, the Cardinals claimed an at-large bid to the DIII NCAA men’s basketball tournament for the second straight year. This gives the team at least one more opportunity to add to the already impressive win total. Tonight, March 2, they’ll host Southern Vermont College, who won the New England Collegiate Conference Title this year. Should they claim victory, they’ll advance to the following weekend. The Cardinals have earned some individual accolades as well. In addition to being a top-10 scorer in the NESCAC, Bonner was named to the Academic All-District first team by the College Sports Information Directors of America (CoSIDA), as well as the All-NESCAC second team. Additionally, Jordan Sears ’18 was named the NESCAC Defensive Player of the Year after averaging nearly two blocks per game and turning in an incredible eight-block performance in the NESCAC quarterfinal against Middlebury. Austin Hutcherson ’21 was named Rookie of the Year after averaging 11 points per game. After their second NESCAC finals appearance in four years, the team heads to the NCAA tournament for the third time in the same time span. The team hopes to get a rocking Silloway this weekend to cheer them onto the next round.